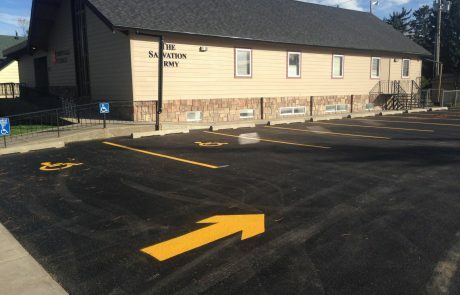 The EverLine Coatings Winnipeg office provides high quality parking lot and property maintenance services. Our experienced professionals provide timely services done to the highest of standards. General Manager – Simon J. How long does EverLine outdoor line painting last? While it does depend on traffic, surface quality and general usage of the parking lot, it is very common to repaint once a year. For high traffic areas it is a good idea to repaint twice per year. We understand it may be a pain to repaint every year. That is where our TBL Durables material comes in! TBL Durables is our durable line paint that chemically bonds to asphalt that will last 3 times longer than standard traffic paint. It stands up to Canada’s harsh winters and will ensure that your traffic markings stay visible all year round, for many years! How long does EverLine indoor line painting last? We will consult with our clients on the best combination of products that will last the longest on any budget. Can EverLine complete a line painting project overnight or on weekends? At each EverLine location we have line painting crews available to complete a line painting project whenever it is convenient for your business. This means we are available on nights and weekends so we can best serve you. I need my parking lot painted right away, can EverLine help? All of the EverLine locations employ multiple line painting crews and this allows us to respond to immediate line painting project requests. So if your business needs a line painting project taken care of immediately our painting crews are ready to help you. Does EverLine offer line painting services for parking garages? At EverLine we understand that parking garages have circumstances and requirements that vary from an outdoor parking lot. Parking garages require specialized line painting treatments and the painting experts at EverLine can help. 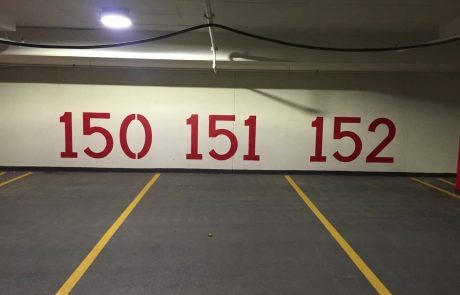 Our line painting crews are experienced and knowledgeable when it comes to providing line painting services for parking garages. How long should I wait before having my parking lot repainted? It is most economically friendly to repaint your parking lot at least once per year. If you wait too long, your lines may fade away entirely and the cost for doing a new layout of the lines is quite higher than just having a regular maintenance program. Once the snow melts, the parking lots must be swept to remove gravel, dirt and debris before we can paint. Once that is done, we can come in and paint the lines! Any asphalt crack filling, seal coating and repair should be done before the line painting gets started. How often does my parking lot require asphalt seal coating? Asphalt should be seal coated every 2-4 years depending on traffic, exposure to the elements and usage. Can EverLine repair the cracks in my parking lot? EverLine is proud to offer crack filling services out of all of our locations. It is important to take care of any cracks that have appeared in your asphalt as 75% of asphalt cracks become potholes. We are more than happy to help with all of your asphalt maintenance needs. Can EverLine sweep my parking lot overnight or on weekends? At EverLine we understand businesses have varying needs and we are here to serve you when it best suits your business. This means that we have parking lot sweeping crews ready to clean your parking lot on weekends and overnight. We will provide exceptional parking lot sweeping services whenever you need us. Does EverLine offer parking lot sweeping for parking garages? Sweeping a parking garage provides specific challenges that sweeping an outdoor parking lot does not. This means you need sweeping professionals that are experienced and knowledgeable in sweeping parking garages. At EverLine we have these professionals, we have multiple sweeping crews at each location that provide remarkable parking garage cleaning services. Can EverLine paint my parking lot in the winter? We wish! When the temperatures go below 6 degrees Celsius, it is too cold for the paint to properly cure. Any paint applied below this temperature has compromised durability and you will not get the value for your money. The best time of year to do line painting is during the Spring, Summer and Fall months. Does EverLine offer snow removal services? Since we are not doing any line painting or parking lot maintenance services in the winter, our same professional approach to project management that we use throughout our thousands of projects during the summer time works very well during the winter months. We make sure that snow removal crews are where they are supposed to be, when they are supposed to be, and that they are completing it in an efficient manner. How does EverLine maintain their quality work? EverLine Coatings and Services has found consistent success by having all employees follow the “EverLine CORE Quality System”. This system ensures that our clients are well informed of your vision with a clear working scope provided to our crews. We have real-time operations reports submitted to us so that our management and clients are fully aware of the status of each project. We reach out to ensure that our clients are totally satisfied. Finally we review our procedures, work and application methods to constantly improve. What makes EverLine standout above our competitors is the fact that we are driven and committed to quality. Some of the keys to our success is that our quality is systemized, we are constantly innovating and we always answer the call. With EverLine you are can be sure that your project is being completed with the highest quality equipment and product, and is being performed by highly trained professionals. To ensure that we are exceeding your standards we always follow up with our clients to make sure our services were performed expertly and the job lasts. Custom Crosswalks and Stenciling : To the extreme!!! Check out our sealcoating and line painting combination! 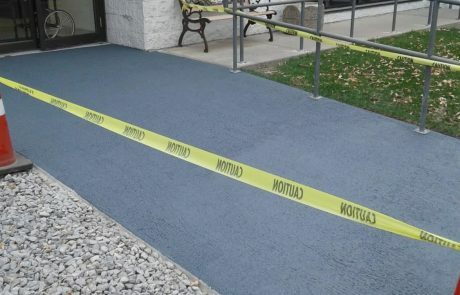 Non-Slip Floor Coatings Revolution – You gotta see this! 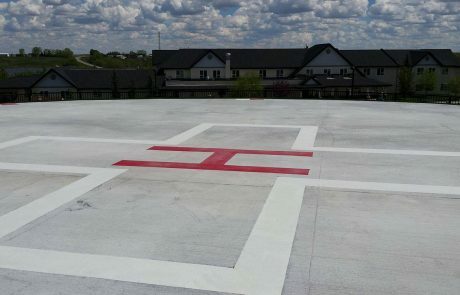 Helipad Line Painting – Who knew? ?